The Royal Mint have confirmed that more than half a billion of the new £1 coins that have been released into circulation will be dated 2016. But you may have also seen in the news that if you find one with a 2016 date, it could be one of the handful of ‘uniquely flawed coins’ and may be worth £250. Coins are typically struck with dies with that year’s date on, and as 1.5 billion new coins were required for the launch of the new 12-sided £1 coin, The Royal Mint started striking them in March 2016. That means that all of the new 12-sided £1 coins that were produced last year will have the 2016 date on them. Will the 2016 12-sided £1 coins be rare? In short, no. With half a billion 2016 dated £1 coins in circulation, they should be relatively easy to get hold of. In fact, we are yet to see someone who has found a 2017 dated £1 in their change. Over half a billion 2016 dated £1 coins have been released into circulation. So far the only 2017 dated £1 coins we have seen are the Brilliant Uncirculated collector versions. If we take a look back to the mintage figures in 1983 when the £1 coin was first introduced, in total 443,053,510 of the Royal Arms £1 coin were struck for circulation that year. That’s a little less than the amount of 2016 dated £1 coins and nearly 3 times less than the total amount of of the new coins struck for launch. Considering 1983 was a time without contactless payments and when cash was the most used method of payment, 443,053,510 seems a relatively small amount in comparison to the 1.5 billion required for the new 12-sided £1 coin launch. You may remember the collecting frenzy that the ‘Queen with a Necklace’ £2 coin caused in 1998 when the brand new bi-metallic coin was introduced into circulation. 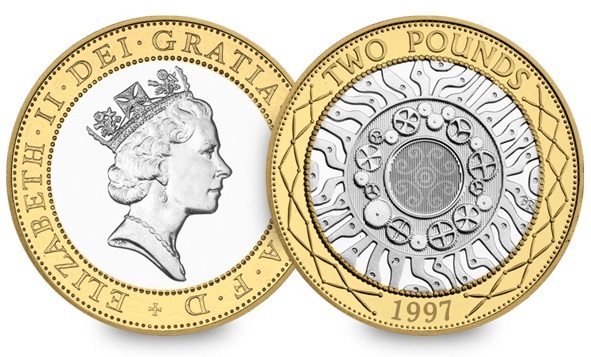 The ‘Queen with a Necklace’ £2 has an enduring legacy in the collecting world as the very first bi-metallic £2 coins issued just prior to the Queen’s portrait change in 1998. This meant that the older portrait by Raphael Maklouf was only used for one year: 1997. His version featured Queen Elizabeth II wearing a necklace, which is how the nickname was derived. An undeniable interest for collectors. And the same can be said for the 2016 dated £1 coin. Although the £1 is in no way a rarity, first year of issue coins are always more sought after in years to come. As the new coin is Britain’s first 12-sided £1 and it is the first specification change to our £1 coin in more than 3 decades, the new 2016 dated £1 should hold a significant place in any coin collection. To celebrate the release of the new 12-sided £1 coin, we’re giving away FIVE ‘Nations of the Crown’ Silver Proof 12-Sided £1 Coins! Post a photo via Facebook, Twitter or Instagram using the hashtag #foundapound and the location you found your first £1 coin. We’ll then choose 5 winners at random on the 10th April. Scarce 2016 “Shield” pound now selling on ebay for £100. Although only three days have passed. Click above link to see. As the £1 coins have only been distributed in particular areas of the country, is there any chance that any will be in Gloucestershire before the closing date of April 10th for the #foundapound competition? The new 2016 and 2017 pound coin was minted in milions to circulate for years. But the old “The shield from the Royal Coat of Arms” by Mathew Dent coin was minted in 2016 only in BU sets in 30,000 – 100,000. Why should they put in circulationa coin and wihdraw it in a fiew months. This one is rare. “The last Dent pound” is selling on ebay for £80.